DJI Spark Mini RC Selfie Drone is now available for purchase. DJI is the major manufacturer of the Drones and every time this company has satisfied their customers with their products. And now the DJI has come up with the new Mmini RC Drone named as DJI Spark Mini RC selfie drone. Every time you go out on vacation in holidays, you like to carry the camera with you o capture the environment. But just imaine that if you get the better view of the environment with a small handy drone. As it is said that the drones capture the 100% of the environment. So it is suggested that you must carry the drone with you next time and the best drone for this is listed here. Why the DJI Spark Mini RC Selfie Drone is the best? To know about this read the features of the Drone provided below. Buy the new DJI Spark Mini RC drone for just $439.99 Gearbest. DJI is the leading manufacturer in drones and the products by the Company are durable and elegant. DJI Spark is a mini drone which boasts all of the DJI’s signature technologies. This allows you to seize the moment whenever you feel inspired. In his DJI Spark Mini Rc drone you get the various intelligent flight modes, a 2-axis mechanical gimbal. The camera of 12MP is provided along with the drone. This camera will give you the clear shots for your journey. This creativity combines and is sure to meet no boundries. The FaceAware feature helps you to launch the DJI Spark Mini Selfie RC Drone on your palm and then send it to the height that is required. The Gesture mode is available on the Drone which will allow you to take the selfies and allow you to control the drone in 3 meters. 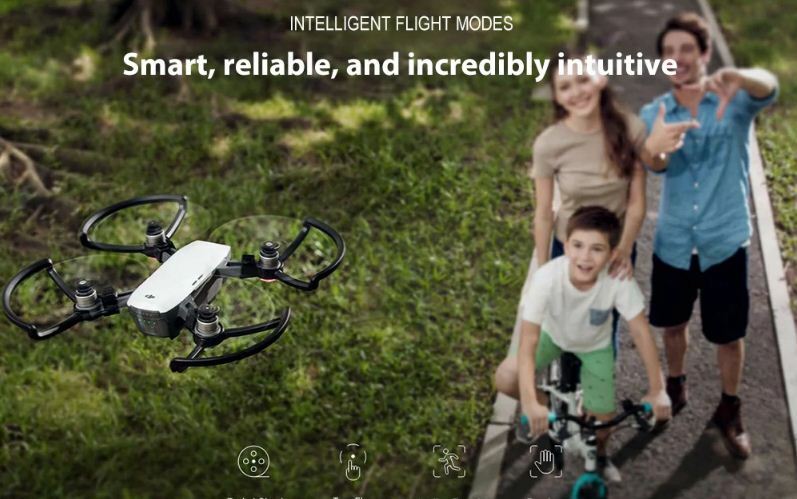 This is DJI’s first ever mini-drone, the drone is small in the size but you can not underestimate the features and the qualities of this drone. If you are trying to shot a video it will provide you the 1080 pixels video and you can shoot a professional video with this. The mechanical gimbal will provide you the 16 minute flight time and the top speed of the DJI Spark Mini RC Selfie Drone is 31mph. You can connect the drone to the phone and you can access the drone for 2 km long-distance image transmission.